A team of enterprising and adventurous scientists in Wyoming has just finished the first in a series of excavations at one of the largest deposits of Ice Age fossils in the United States. At the bottom of a sinkhole as deep as an eight-story building, paleontologists have recovered well-preserved remains of giant camels, American lions, dire wolves and a cheetah-like big cat, among other finds. And, the scientists say, many of the specimens still likely have their DNA intact, suggesting that the cave may be an unprecedented trove of genetic information from America’s extinct animals. “The range of species we recovered, especially carnivores such as the American lion and cheetah-like cat, are remarkable,” said Dr. Julie Meachen of Des Moines University, in a press statement. 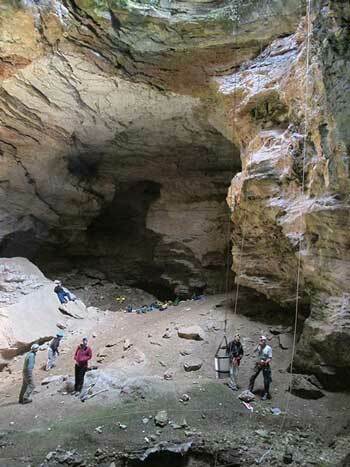 What’s more, the specimens that the scientists retrieved from the cave are by no means alone. 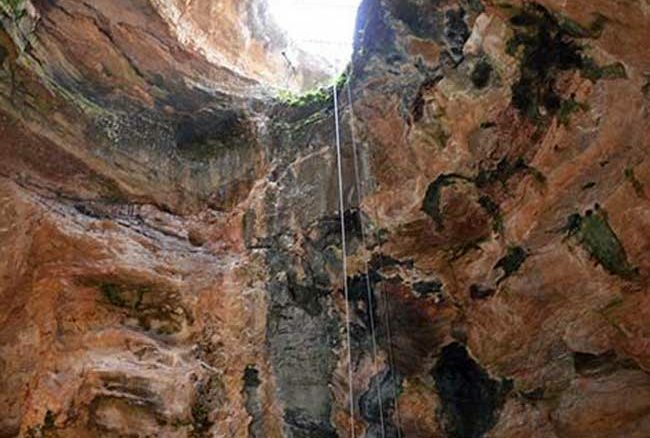 Instead, they’re only a few, relatively recent victims of the aptly-named Natural Trap Cave, a rare sinkhole that has ensnared countless animals over more than 100,000 years. 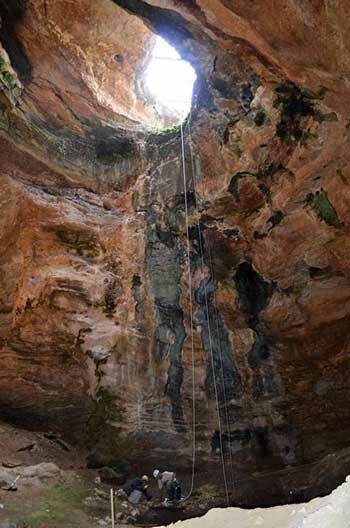 The cave opening is a sudden hole in the ground some 4.5 meters wide. Through it awaits a 26-meter drop — straight down. The cave was first explored in the 1970s, when paleontologists rappelled down and discovered more than 30,000 animal specimens, leaving countless more undisturbed. Today, scientists have technology that allows them to read more deeply into the bones. So it’s now possible to extract and possibly sequence some of the animals’ DNA, as well as look for other chemical clues — like the ratios of isotopes in their teeth and bones to learn about their diet. “Excavation of these world-class fossils for state-of-the-art analyses … will lead to a better understanding of the life and times of Ice Age animals in North America,” BLM’s Regional Paleontologist Brent Breithaupt said. This summer’s investigation, conducted in August, was the first season in a three-year program, the team said. Aside from excavating what they could, researchers spent much of the season simply figuring out how to safely get themselves and their gear down the sinkhole and out again. “We were basically assessing the logistics of getting the science team into the cave, and the quality and range of material to be excavated,” Meachen said. Awesome, I hope they clone the Cheetah like Cat!! I hope the BLM is not requiring the tossing of Equs as they have been known to in the past. Horses evolved in North America. This native species is one of the few survivors of the ice age along with humans. DNA on the horse remains please. Or at least a complete listing of all species collected so far. Naming a few and than “among others” isn’t enough of a report. The sinkhole was discovered in 2003? the wait is to long for the Wild Horses, a native species of North America.